Mixing clay is generally not done by most studio potters. Instead, most of us buy premixed pottery clay neatly pugged and packaged in a plastic bag. But some potters choose to mix their own clay to have more creative control over their work. The easiest method for mixing clay is to use a clay mixer, but if you want to test a small batch, you might want to mix by hand. In today’s post, Richard Zakin and Frederick Bartolovic explain how to mix small or large batches! – Jennifer Poellot Harnetty, editor. Mixing clay in the studio is a relatively simple process. Small batches can be mixed by hand and do not require any special equipment for mixing. 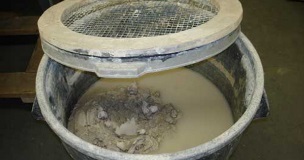 Larger batches of clay will require a clay mixer, a machine designed to churn the components of a clay body with water until it reaches a consistency suitable for use. Clay mixers are large heavy machines which also require some form of ventilation around them to remove dust generated during the clay mixing process. For this reason many contemporary ceramists do not mix their own clay but rely on a commercial clay supplier. This makes sense in terms of saving studio space needed for mixing equipment, as well as safety and convenience. It is, however, useful to know how to make clay bodies in both large and small batches. The electric kiln has helped to open the doors of the ceramic world to more and more people due to its convenience, ease of use, and economical benefits, and this new edition of Electric Kiln Ceramics is a must-read for anyone firing electric kilns. There may come a time when you wish to test a new clay body recipe or to make a small amount of a special clay body, such as a porcelain or a grit-loaded clay body. The mixing process described here is not difficult. It is fairly quick, not terribly demanding, and does not require expensive, complex, or dangerous machinery. 1. Weigh all the clay body materials. 2. Mix the dry materials carefully together. 3. Place the materials on a large water-resistant surface such as a large piece of linoleum or a stainless steel table. 4. Form the powdered clay into a mound in the center of the mixing area. 5. Form the mound into an atoll structure; a central mound surrounded by a circular doughnut-shaped wall. This creates a moat-like trench around the central mound. You are now ready to add water. To get a workable consistency clay body you will need on average about 30% (+/-5%) of the weight of the clay. 6. Pour the water into the moat-like trench and let it sit for a few minutes. If water leaks through the wall of the structure, press some extra powdered clay against that section. 7. Push the dry clay at the top of the doughnut-shaped wall into the water in the moat. Do the same with the clay in the central mound. After a few minutes of this action, the clay and the water should be fairly well mixed. 8. Allow this mixture to sit for a few minutes, then begin wedging the clay body. Note: When wedging, it’s a good idea to pass a wire through the clay several times. Separate the pieces, shuffle them, and wedge again to ensure a homogenous mixture. 9. Make adjustments if necessary. Wait until the end of the mixing process before making any adjustments. Only then will you know if you need to make them. If the clay is too dry, use a spray bottle to slowly add a bit more water, distributing the water evenly. If the clay is too wet, let it air dry until it reaches the consistency you desire. Make notations so you can adjust appropriately next time. Place the clay body in a plastic container. If possible let the mixture rest for a week or so before using it. This aging allows the bacteria in the clay body to multiply. These bacteria are not harmful—in fact they encourage a workable clay body. Clay bodies which have aged are usually much more plastic than ones that have not. Note: Mixing clay inevitably involves creating a considerable amount of dust, as clay particles are some of the smallest particles known to man and stay airborne for up to 48 hours. Use ventilation or respiratory precautions. Mixing larger batches of clay is a physically demanding activity often requiring the moving of 50 pound bags of raw materials. It also requires a clay mixer which additionally necessitates following manufacturer safety precautions and employing respiratory protection. The mixing process described below is fairly quick and produces enough clay to last a while depending on your production level. 1. Weigh all the clay body materials and place them into a large container. 2. Mix the dry materials together so each material becomes dispersed evenly. 3. Measure out your water and place it in your clay mixer. Through smaller batch testing you should know the exact amount of water needed. It should be about 30% (+/-5%) of the weight of the clay. 4. If it is possible to add dry material to your mixer while it is running then turn your clay mixer on. Otherwise you will need to add material to your mixer through turning it off, adding dry material, then turning the mixer back on again. 5. It is better to slowly add your dry mix to the water as opposed to adding all the dry mix at once. Slowly introducing the dry materials allows you to control the consistency. Depending on what you are intending to build with the clay you may want a wetter or dryer mixture. 6. Once you have used all your dry material and achieved the correct consistency allow the mixer to run for an additional 15–30 minutes. This will insure all the materials are thoroughly mixed. 7. Unload the mixer. Place the clay body in an airtight container. If possible let the clay rest for a week or so before using it. This allows the clay to age becoming more plastic and workable. 8. Clean the clay mixer. This may be one of more time consuming parts of the mixing experience, but it is important to thoroughly clean the mixer so if you mix a different kind of clay next time the new body will not be contaminated in any way. 9. After using the clay take notations so you can adjust proportions of water to clay if needed next time. Notes on mixing clay in large batches: Clay mixers can be dangerous if not used properly. Follow the manufacturer’s directions and never bypass safety switches or place yourself in close proximity to the mixer when it is running. If clay is too dry when mixing add water very slowly into the mix. Clay particles are so fine that they tend to absorb additional moisture in the first 24 hours after being mixed. For this reason I usually suggest mixing slightly on the wetter side knowing that the clay will stiffen up a bit after mixing. Add:, body, ceramic, ceramics, clay, clay body, clay body recipe, clay mixer, clay mixers, consistency, contemporary, creative, dry, electric kiln, electric kiln ceramics, equipment, firing, form, how to make clay, in the studio, kiln, kiln ceramics, materials, mixer, mixing, mixing clay, porcelain, potters, pottery, pottery clay, powdered clay, process, protection, quick, raw materials, recipe, richard zakin, safety, studio, surface, table, time, water, wedging. We potters love collectors who appreciate the process! Thanks for sharing. I’m a new potter and it’s so interesting to see how clay is made. Of course I get mine in a plastic bag and did not think about making it. I’m hooked. Love working with clay. Do not like glazing because of the unknown but I’m sure I will learn. Thanks for sharing the mixing process. I took classes in throwing clay pots but found it too tiresome so I appreciate potters and their work.